Going to the temple to seal Kenzie to our family forever. I love this part about adopting. You feel the spirit so strongly there. We had the kids all dressed in white and when they came walking in, they looked so heavenly and happy. Kenzie sat and stared at the chandelier. After the sealing we got to look in the mirror and see all of us forever. I can not describe the feeling. I had a hard time looking in the mirror because I knew that my family was complete and if I looked I would start to cry and lose it. But I wanted that mental picture to always look back on. We are an eternal family. I am so grateful to have a wonderful husband who has taken me to the temple. For my kids who keep me young and the gospel. With out the gospel I would be lost. I know that families are forever and am grateful that my children could witness this wonderful occasion and feel of that spirit that was there and want to return to the temple again so that they can be married for time and all eternity. 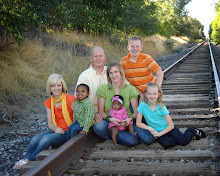 Today we got up early to get ready to take the family to the Provo district court to finalize Kenzie. We met with the lawyer to go over a few things and headed into court. We had our family and friend there to support us. The kids sat very quiet even Ty didn't make a peep. The judge congratulated us and walk down from his podium to shake our hands and get a picture with the family. Our judge was Fred Howard. After we got all the paperwork done we headed to IHOP for a late breakfast. The weather was beautiful. This is the view from the zoo. Can you say AMAZING!!! This is at the Blue Mountains and this is the best and coolest picture we took. We got to see the kangaroos in the wild. Overlooking Sydney with the bridge in the back ground. We were on a tour of the Opera house. Bondi Beach this is one awesome beach. They do have sharks come into this beach every so often. SCARY! The Steve Irwin ship. Yes this is the Whale Wars ship. We got to go for a little tour and a couple of days later they left to go fight the Japanese. The Opera house. This is one amazing building. Good Day mate. This trip was amazing. How many times have I said that so far? It truley was AMAZING!!! I was not so sure about the 14 hour flight over there but it went by faster then I thought it was going to. This plane was huge. It had an individual tv in each sit and you could watch a number of movies, tv shows,play games or talk back and forth with each other. There is a day and 6 hour difference from here in the US. The first night we took a dinner boat cruise which was awesome, but it rained like cats and dogs on our way over so we were soaking wet when we got there and then it stopped raining and was cold. But the view of the city at night WOW! The next morning which was now Wednesday the 7th cause we lost a day going over. Yea we didn't have monday. That was crazy. Any whooo. We took a tour of the city. Saw all the famous site of the city so we knew where we wanted to go. We took a tour or the Sydney Opera house and learned where the design of it came from. They held a national contest and a guy named John Ulzon from Germany won the contest. It was going to cost 9 milllion to build it actually cost 110 million. They raised all the money from a lottery. The sad thing is John Ulzon never got to see the Opera house finish. He got upset about a couple of things and he left and never saw is completed he just die this year at the age of 85. Thursday the 8th we went to a homestead and saw a sheep being sheared, learned how to throw a boom-o-rang and hold diffrent animals native to Australia. We had a wonderful BBG lunch. Some of the drinks are diffrent then ours. We asked for lemonade and we got Sprite and a drink called lemon squash tasted like a squirt here. Friday the 9th we did a tour of the Blue Mountians. It is a place in the mountains that the aborigines lived. There are what is called the three sisters. They are three mountains that are very close together. Our tour guide was awesome he told us every kind of flower, tree and spider. Thankfully we didn't see any because they have the worlds deadlest spiders and snakes. Saturday the 10th we went to the Tarango Zoo. This zoo is huge. Animals of ever kind. Koalas that you could hold and kangaroos that you could walk right into there habitat. They had the cutest little seal that they rescued off the shore of the ocean. We saw gorillas find their food and chimps that would do somersaults and land on all the other monkeys. We did a little shopping at the Rocks. Every Saturday and Sunday they have like street vendors up two streets and walk through and find just about anything that you like. Sunday the 11th we went up to Darling Harbour watched a movie on the Great Barrier Reef. We went into china town where they had a huge building that you could shop at we came out with so much stuff that we wish we would have waited to shop until this day. We had dinner at a revolving building that you could get a 360 degree view of the whole city. Last day Monday the 12th we went to Manley Beach. It was a nice beach but it was so cold and windy. we just walked around for a little while and came back and had the best fish and chips ever. At a place called City Extra. Yes the fish was shark called flake. It is by far the best fish I have ever had and I don't think that I could ever have fish and chips in the states ever again. I have to tell you a funny story. Over in Australia they have different plugs for everything so we brough a converter and outlet to use while we were over there. Well the first day I get it out and it works great while I am drying my hair. I did notice that the air on the hair dryer was getting hotter and hotter the more I used it. Got that done and I plug my straightner in and the next thing I hear is a pop and a spark. Yes the converter is smoking. GREAT!!! Now what am I going to do my hair is not straight and I just broke the outlet. I guess I could wear a hat. We got the hotel to come up and look at it and they brought us a bigger converter that took up the whole countertop pratically and I could plug my straightner right into it with out a diffrent outlet plug. Didn't have anymore problems with the outlets. We had a great time. I would have loved to climb the Harbour bridge but no one wanted to do it with me and it was a little pricey. So instead I got me a pair of UGG's and an opal necklace. Since that is what they are knwon for. We also went and saw Wicked. Brad loved it surprisingly. Would love to go back again the flights were not bad. The best part was getting away from the kids and the nanny potty trained Ty while we were gone. SCORE!!!! Miley Cyrus concert tickets are what Cortlyn got for her birthday. She was so excited to go. We took her to dinner at TGIFridays. When we got to Energy Solutions Building we counted as least 24 semi trucks and 6 big bus motor homes. We were a little early so we got in the line to get Cortlyn a tee shirt. Yes we waited 40 minutes, not sure what we were thinking. Metro Station started at 7:00. They sing shake, shake ,shake it. And come to find out it was Miley's big brothers band. At 8:00 Miley can on. She came through a clear rock that looked like an ice boulder. During her third song which was 7 things I hate about you. She ran off the stage. We were all thinking she is changing but after a couple of minutes she didn't come back and the back up singers are singing the song we knew something was wrong. She had the touch of the flu. But five minutes later she was back on stage and singing. She didn't put on the best show. You could tell she was not feeling well. But by the end of the concert she was doing better. Cortlyn loved the concert. She sang and danced to all the songs she knew. Miley flew over the crowd twice. Once just by herself and the other time she was riding a Harley Motorcycle. She definitely put on a great concert with all of her stage effects. She ended the night with her song the Climb. I think I would buy tickets to go to her again. We had a lot of fun and Cortyln was all smiles. There is nothing better than that!! !